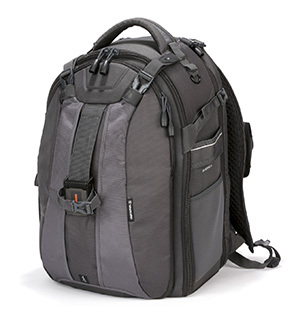 The Jackpack Half Photo Backpack is engineered around the astute realisation that people who want to carry a lot of camera kit might also want to carry a lot else. Thus the Half Photo system was born. The interior space of the backpack is divided into two parts: one for camera gear and the other for anything else. Crumpler is held in high regard for the superior construction of its bags, and the Jackpack Half Photo is no exception. The 1000d ChickenTexSupreme exterior fabric (yes, that’s correct) is resistant to abrasion and tearing, and a protective lining within keeps camera gear safe. Measuring 32x45x19cm and weighing 1.27kg, there’s room for storing a decent-sized DSLR with a couple of mid-sized zoom lens. Inside Skyborne’s shock-absorbent maincompartment are 11 Velcro-style padded dividers that can be configured to a photographer’s needs. We fitted two large DSLRs, each mounted with mid to long-range telephoto lenses, plus two prime lenses, two flashguns and a collapsible softbox inside the main storage area. There’s also a large front pocket for a jacket, cables and batteries, as well as a separate removable sleeve on the back for a 17in laptop. 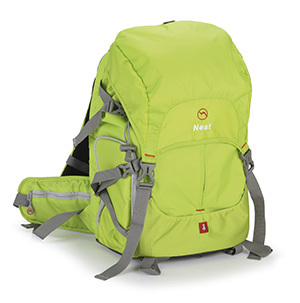 Despite the weight of the kit, the bag’s air-infused cushioning and ergonomic harness system make it an extremely comfortable backpack to use. The Vanguard Skyborne 53 measures 39x44x60cm, weighs 3.34kg and comes with the company’s limited lifetime guarantee. 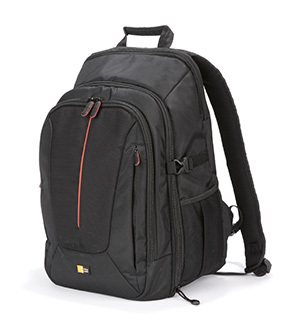 This is a top backpack for anyone who has a lot of kit that they need to carry securely and comfortably. Looks are deceiving when it comes to the DCB-309 backpack, which is capable of storing two DSLRs, even when one is mounted with a 70-200mm f/2.8 lens. Measuring 43.9×21.3x29cm and weighing 1.54kg, there’s also room for two further lenses and an external flashgun in the main compartment, and a 15in laptop in the separate padded zipper pocket. A small tripod or monopod can be slipped into the side pocket and secured, although this essentially renders that pocket useless so we just strapped it into the clip provided. A weather hood is stored in a safe pocket, which can only be accessed by the wearer, so it’s perfect for carrying valuables. This backpack is so incredibly green it’s difficult to look at for too long. It’s like having a traffic warden’s torso strapped to your back. This needn’t be a bad thing – if you’re a cyclist, it could be a wise way of making you and your gear more visible. Still, if it’s not to your taste there’s also blue, black and orange. 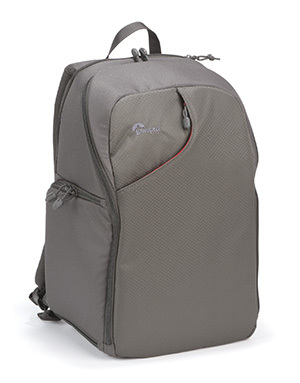 Colour aside, the 1.35kg backpack feels well made, with water-resistant nylon, high-grade zips and dimensions of 28x23x49.5cm that can accommodate a DSLR with a mid-range telephoto lens attached, and spare lenses on top of that. The thick shoulder harness is nice and comfortable, and the padded, breathable waist belt adds security. For speedy access to your kit, the Lowepro Transit Backpack 350AW is a perfect solution for city breaks and street photography. Measuring 33×26.5×45.5cm and weighing 1.1kg, it is designed to store a DSLR mounted with a large lens, two additional medium-sized lenses, a flashgun and accessories. On the side of the bag there’s space to secure a tripod, and room for a 15in laptop in the dedicated padded compartment at the back. Made from weather-resistant 600D polyester, the Transit Backpack 350AW also comes with a self-contained anti-dust and rain cover for added protection from the elements. 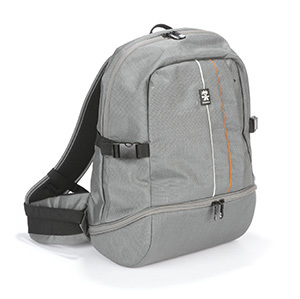 The versatility and quick-access pocket are the best things about this backpack. The bag can be swung round to your front and you can start shooting at will, without the hassle of removing it completely. Ideal for nature and sports photographers, this is one of the larger bags we looked at, measuring 38×32.5x54cm and weighing just 2.1kg. Just like the Vanguard backpack, it can also hold two mounted DSLRs, two flashguns and up to four additional lenses. The bag has an ergonomic ventilation system to provide comfort and to reduce heat on your back when carrying it for long periods of time, or in warm environments. 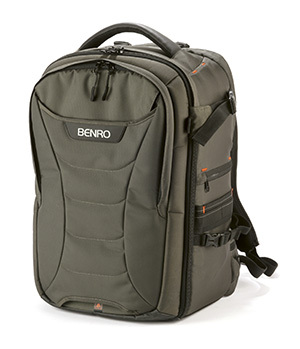 This is the only bag in the test to have the laptop compartment at the front of the bag, which Benro says is to protect your computer from damp caused by temperature fluctuations in body heat. A harness system distributes weight superbly, making this a great solution for long journeys or hiking.